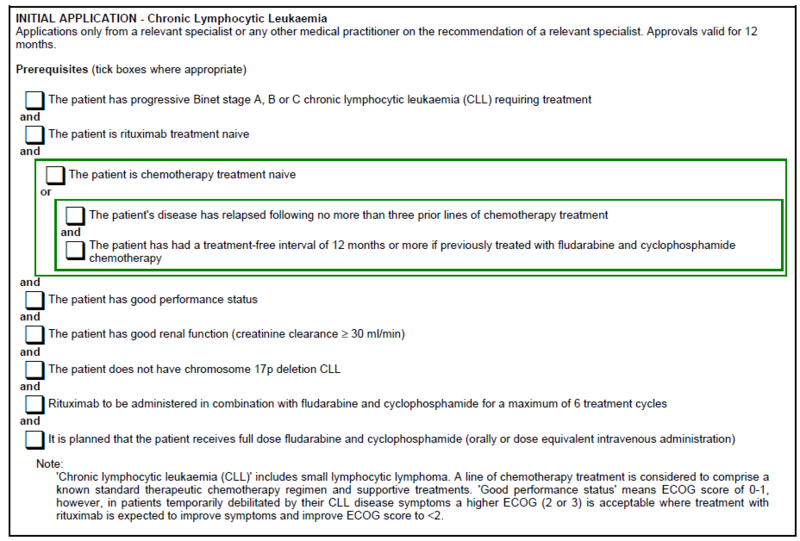 A copy of the prescription sheet for Alemtuzumab treatment in CLL is available. For a general review of transplantation in CLL see Tam, C. S. and I. Khouri (2009). "The role of stem cell transplantation in the management of chronic lymphocytic leukaemia." Hematol Oncol or Gribben, J. G. (2008). "Stem cell transplantation in chronic lymphocytic leukemia." Biol Blood Marrow Transplant 15(1 Suppl): 53-8. The UKCLL forum has produced recommendations for transplant in CLL. The results of two randomised controlled trials of auto-SCT were reported at the ASH Annual Scientific Meeting in New Orleans in 2009. A phase 3 EBMT sponsored trial aimed to randomise 270 patients in CR or PR after 1st or 2nd line therapy between ASCT and no consolidation. The trial was closed in 2007 due to slow accrual after 223 patients were enrolled. Consolidation ASCT in first or second remission reduced the risk of progression but did not improve overall survival (Michallet, M. et al. (2009). Blood (ASH Annual Meeting Abstracts) 114(22): 877). The French Study Group on CLL randomised patients in CR after first line therapy to either observation of ASCT. Patients in less than CR were offered salvage chemotherapy and randomised to either ASCT or FC chemotherapy. ASCT in CR improved event-free survival but not overall survival. For patients not in CR after induction chemotherapy ASCT and FC chemotherapy produced similar EFS and OS (Sutton et al (2009) Blood (ASH Annual Meeting Abstracts) 114(22): 878). Young patients with adverse prognostic factors will die from their disease and higher risk strategies are warranted. Allogeneic transplants are particularly indicated in fludarabine refractory patients, that is those who relapse in 1 year or less after last fludarabine, and also in 17p deletion where it may give long term survival, unlike any other treatment. However, in the era of increased availability of novel agents, the number of allogeneic transplantation for CLL have decreased markedly in both Europe and the United States. In New Zealand we are limited by the availability of novel agents such as ibrutinib, idelalisib, or venetoclax. For more information, see Gribben J. How and when I do allogeneic transplant in CLL. Blood. 2018 132:31-39. Non-randomised comparisons between RIC and ablative conditioning have shown equivalent transplant-related mortality (TRM) and overall survival (OS) in fitter patients but improved TRM and OS after RIC for patients with comorbidities. It is recommended that such transplants continue to be performed on accepted clinical protocols. For a review of outcomes after allogeneic transplantation, see Sorror, M. L. et al. (2008). J Clin Oncol 26(30): 4912-20.